Autumn is as good a time as any to rock a new signature lip colour, whether it's a vampy hue or an everyday neutral, so consider this Lipstick Week at Solo Lisa as I showcase some of the best lippies to have crossed my beauty desk this season, from luxe to green and drugstore options. First up? The newly relaunched Rouge Dior Lipstick ($43). I have the scoop on what's changed after the jump! 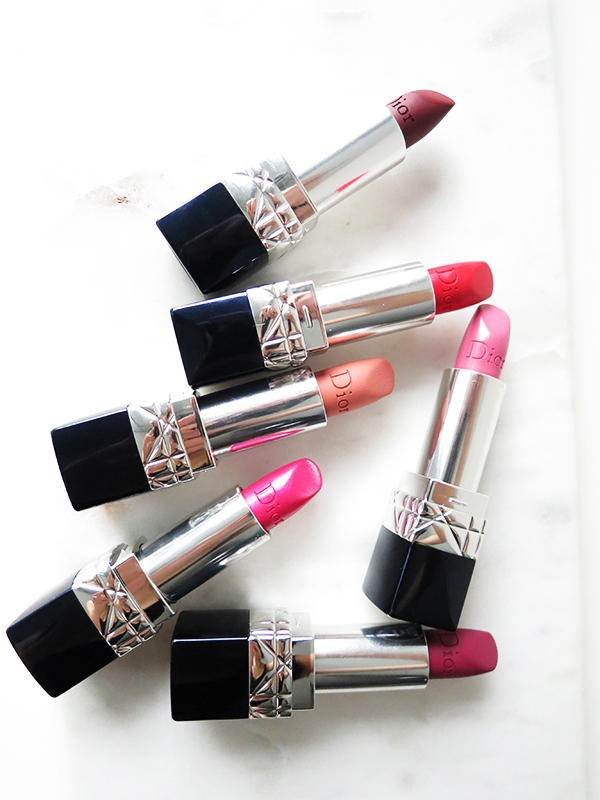 Longtime fans of Rouge Dior might notice a few packaging tweaks in the new lipsticks compared to previous ones. The case is slightly taller and slimmer. The cap's silver monogram is a sleek sans serif version, while its interior is lined with scarlet—999, to be exact, the iconic Dior shade of red that can trace its roots back to the shade of red lipstick Christian Dior used in his first runway show. I couldn't get a good photo of the inside of the cap, but you can see it better on Dior's website. There are now 35 satin shades in corals, reds, pinks, and nudes, as well as 15 matte shades. 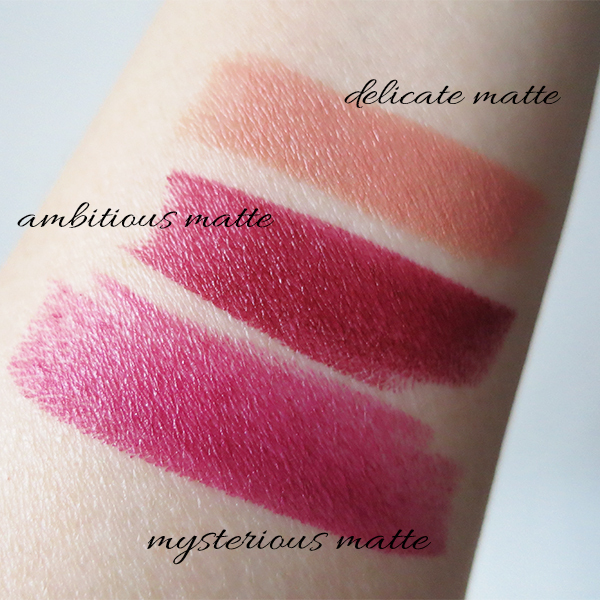 4 of the mattes are darker and more avant garde shades dubbed Extreme Matte. 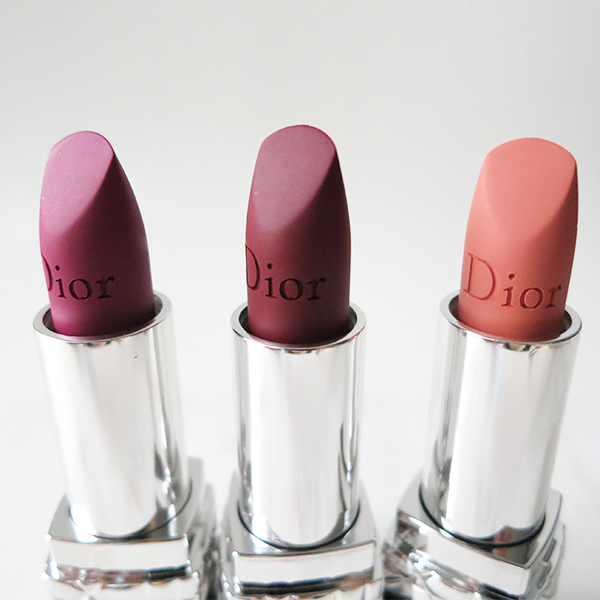 I love how Dior's mattes aren't completely flat, which can look severe. Rather, they're a soft velvety matte with light, depth, and dimension—so much more flattering on faces of all ages. 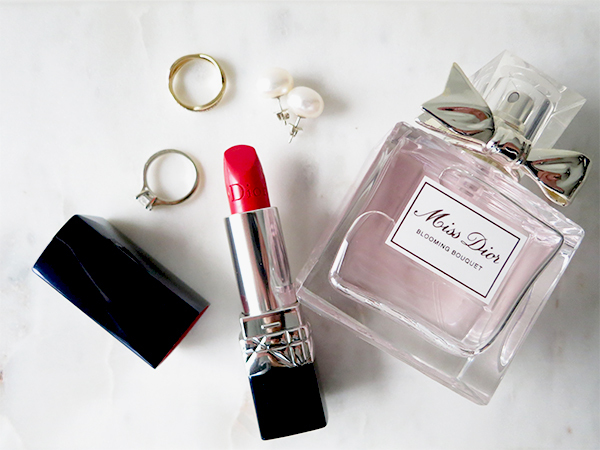 The emollient ingredients in Rouge Dior give the colour a slight sheen when you first apply the lipstick right from the bullet, but it does become more muted as the moisturizers absorb into lips. Swatched here: 897 'Mysterious Matte' (a cool, bright plum); 964 'Ambitious Matte' (a warmer, deeper plum); and 136 'Delicate Matte' (a balanced beige). The satin shades have more sheen and dimension to them. 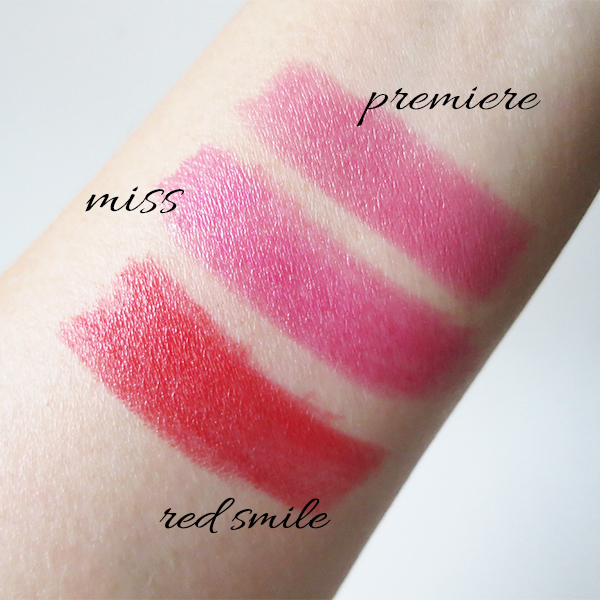 Swatched here: 080 'Red Smile' (a universally flattering coral red and the same shade Natalie Portman is wearing in the Rouge Dior #ifeelgood ads); 047 'Miss' (fuchsia with a stealth shimmer); and 060 'Premiere'(a deep but bright rose pink with stealth shimmer). 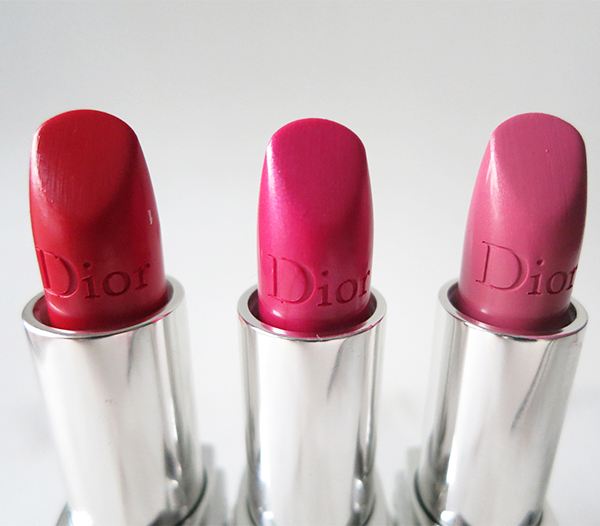 Longtime readers of this blog know that Rouge Dior is one of my all-time favourite lipsticks ever. The formula—infused with mango butter, areolat sampira, and hyaluronic acid— plumps and hydrates lips. It has plenty of good slip and feels so moisturizing and comfortable compared to other matte lipsticks, it's like wearing a lip balm. I'm prone to very dry lips, especially in the fall and winter, and Rouge Dior is one of the only matte lipstick formulas I can tolerate for all-day wear. What's more, it's pigmented and long-lasting enough for a single application to survive coffee, breakfast, lunch, and a light afternoon snack with only one or two touch-ups throughout the day. Finally, there's the form factor to consider. As precise as lip brushes are, and as user-friendly as sponge-tip applicators can be, I still think nothing is as sophisticated as applying a classic twist-up lipstick straight from the tube. Rouge Dior's cannage-decked tube is undeniably elegant and the bullet is ergonomically cut to create a straight line and fill in lips with ease. This truly is my Holy Grail lipstick, and I'm so glad that while the packaging may be different and more shades may be available, Dior has kept everything I love about Rouge Dior in this next generation of lippies.